In the first hadeeth, it mentions that Fātimah bint Abee Hubaish (radiyallahu ‘anhā) had bleeding in other than the times of her period. So she came to the Prophet (ﷺ) wanting to know what she is to do: does she take the same ruling as a menstruating woman such that she stops praying, fasting and having sexual relations? So he responded with a comprehensive answer. He told her that menstrual blood is dark, blackish and recognisable, unlike the blood of istihādah (prolonged irregular bleeding) which is red. So this is the difference between menstrual bleeding and prolonged bleeding. There are other differences also. 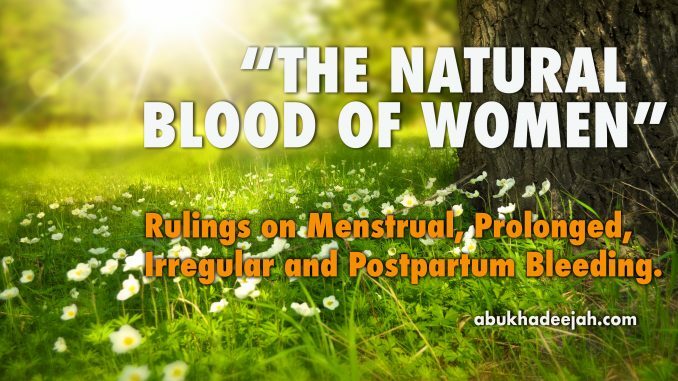 Menstrual blood is viscous and thick, whereas as istihādah blood is smooth and thin. Furthermore, menstrual blood is recognisable — meaning women know it. The hadeeth also carries the meaning that it has a foul and unpleasant odour due to the word, “yu’raf” which has also been narrated as “yu’rif” which refers to a foul odour. So when the blood is dark, blackish, thick and has an unpleasant smell, then she is to withhold from the prayers. However, if it is not like that, not blackish but rather red and thin, then she is to make wudoo and pray. So this hadeeth explains the difference between the two types of blood in terms of characteristics and rulings. So the ruling on the menstruating woman is that she does not pray or fast, whereas the woman suffering from prolonged bleeding prays and fasts. As for the hadeeth of Asmā’ bint ‘Umays — then she was a noble Companion, may Allah be pleased with her. She migrated twice, once to Abyssinia and then to Madinah. She was the wife of Ja’far Ibn Abee Tālib (radiyallahu ‘anhu). She migrated with him to Abyssinia (Ethiopia). Then Ja’far was martyred at the battle of Mu’tah. Thereafter she married Abu Bakr As-Siddeeq (radiyallāhu ‘anhu) and she bore him Muhammad Ibn Abee Bakr. Then after the death of Abu Bakr, she married the leader of the faithful, ‘Ali Ibn Abee Tālib (radiyallāhu ‘anhu) and bore him a son too, Yahyā Ibn Ali Ibn Abee Tālib. When ‘Ali was martyred through assassination, she did not remarry. 1. A clarification of how a woman suffering from prolonged bleeding knows that her menses has come to an end: she sits in a bath and pours water over herself, and if a yellowish colour appears on the surface, she knows it is istihādah and not menses. And the first hadeeth informs us of the difference between menstrual blood and istihādah blood. Taken from Shaikh Sālih al-Fawzān’s explanation of Buloogh al-Marām min Adillatil-Ahkām of Al-Hāfidh Ahmad Ibn ‘Alee Ibn Hajr al-Asqalānee (Born 773H, Died 852H). Shaikh Al-Fawzān’s tremendous explanation is entitled Tas-heel al-Ilmām bi-fiqhil-Ahādeeth min Bulooghil-Marām and is printed in seven volumes. The above is a translation of this important and very enlightening chapter (from volume 1), adapted slightly in places, and more detail added to ease understanding.